To create a Fastcall ACD (automated call distribution) you start by creating a group with your ACD users. BTW, the Fastcall group uses the Salesforce group for users, but we add functionality to our custom object. Next, create an IVR (interactive voice response) that uses call transfer as the action. The scope is a transfer to the group you created. You can set an initial greeting, call recording or a “no answer IVR.” The ACD strategy options include round robin or simulring. The ACD timeout is the time in seconds to ring the ACD. Last, provision a phone number and assign it to an IVR you created. Easy, right? When setting a new number you are given two options: User Inbound – a phone for a single user; or ACD. 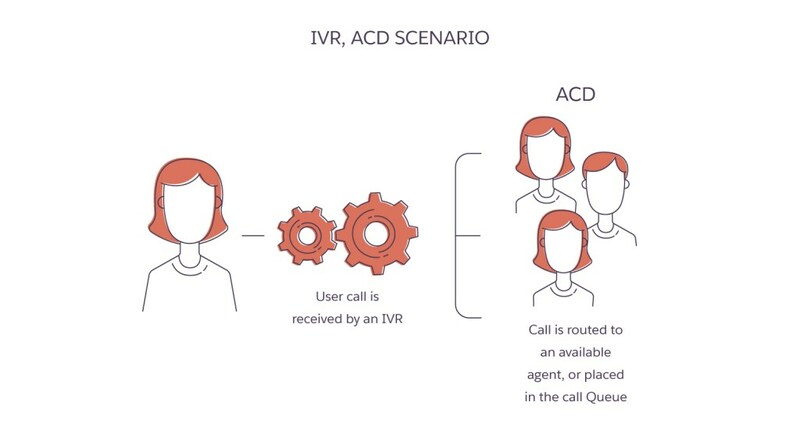 For the Fastcall ACD, a phone number is provisioned an assigned to an IVR which contains the ACD. BeLocal uses the Fastcall ACD when routing BeLocal inbound calls; that is when the called party calls back the caller ID. One benefit of BeLocal is that returned calls increase because of the local caller ID. Unlike user phones which can overflow or simulring many users phones (personal phones), the ACD calls the user on one phone designated as the ACD phone. Next, the Fastcall ACD uses Fastcall groups to set distribution. As you may know, Salesforce Groups are groups of Salesforce users and Fastcall does use Salesforce groups. Salesforce Groups can also include other Groups and can use Salesforce Roles but we cannot use these for the ACD. Users only. Put 5 users in a Fastcall group, for example, and those five users are in rotation for an inbound call. When using the Fastcall application for outbound calls we know your status (available, on a call, offline) and we use this status to route inbound calls. Five users in the ACD Group, four are on a call, the 5th will receive the call. If all five are available, then we ring round robin. Fastcall also supports simulring (rings all five at once, first to answer gets the call.) You set these options in the IVR setup. NOTE: When ringing each user in rotation it is important that the user’s office or mobile phone voicemail does not answer the call. This would only happen if you are using an office or mobile phone; and not the Fastcall softphone. If the user’s voicemail grabs the call, the ACD rotation stops.